Fuerteventura is the nearest Canary Island to the coast of Africa and is the second largest of the Canary Islands, after Tenerife, the largest one. The weather in Fuerteventura is comparable to that of Mexico and Florida, which share the same latitude. It has some of the most imposing beaches in the continent of Europe, with a length of about 98 kilometers and a width of about 30 kilometers at the widest point. It is also known for the massive sand dunes that cannot be found on other Canaries. With such nature-oriented features and sunny weather, Fuerteventura is undoubtedly a famous adventure holiday destination. There are several means to explore the beautiful island, but quad and buggy excursions provide a different and fun experience for visitors. They can explore remote places where it is not possible to take cars, and enjoy spectacular views along the route. Besides, the chilling wind coupled with the smell of dust provides an unusual yet pleasant experience. Quad excursions are customized even for beginners. Quads allow adventurous tourists to drive over hills, valleys and trails that are rugged and different from normal road conditions. A quad is an open motorized buggy with a seat bestrides the operator and handlebars for control. The rider operates the vehicle much like a motorbike, but the additional wheels render better stability as they are intended for off-road use. The 4×4 quads are common and even fun as they enable visitors to get a view of some panoramic spots that they will otherwise miss. Tour operators provide quad safari guides to lead the way. Hence, even those who have never ridden a quad can operate it safely with guidance from expert instructors and proper use of safety gear. They ride below craters, down the valleys and up the coast through the course of the expedition that may last for hours at a stretch. Visitors can hire quads for a number of hours, such as 3, 6 or even 24 hours. The person who intends to operate the quad should have a valid drivers’ license. The minimum age requirement for a quad ride is usually 12 years. Quad companies include the compulsory insurance in their pricing though visitors may request for additional coverage. They offer several types of excursions depending on the needs of the participants. 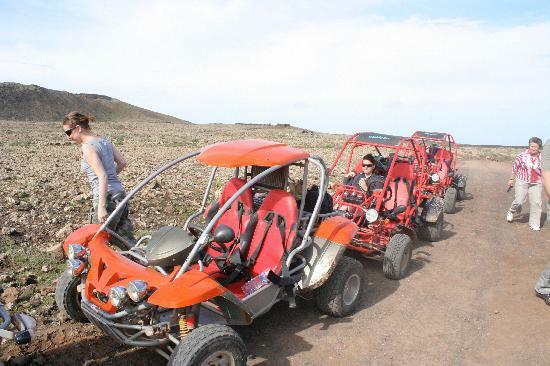 For instance, Fuerteventura quad in Jandia offers excursions that are suitable for families, leading them to the southern part of the island through desert dunes and other exploratory territories. Other popular companies are Xtreme Car Rental in Costa Calma, Montes Quads in Jandia, Quad Safari Fuerteventura and, Animal Quad and Aventura Buggy. Fuerteventura quad biking allows adventure enthusiasts to visit caves and beaches, and ride through unexplored routes. Quad services include all the essentials, such as safety equipment, insurance and even snacks or drinks.